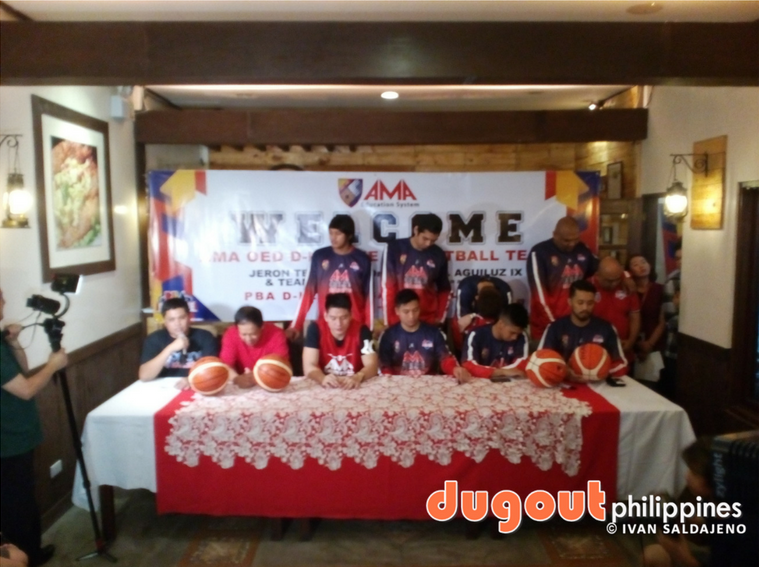 QUEZON CITY--The PBA D-League season has not even started yet, but AMA is already thinking about the PBA. The Philippines' top IT university told the media about its intent of joining the top-tier cagefest on Wednesday. "We're just waiting for the opportunity for the PBA governors to call us for a confirmation, but our way to the PBA is through expansion," said Arnel Hibo, the senior vice president of the said school and also the manager of its varsity teams as well as its PBA D-League team. The Titans held a press conference at the Bagoong Club to unveil their 2017 lineup led by Jeron Teng, Diego Dario, Ryan Arambulo, and JR Taganas. Hibo also reiterated that the team, should the PBA application gets approved, will play under the AMA Online Education banner while keeping its D-League team under the name AMA University with players from its NAASCU squad. In a separate interview with Dugout Philippines, Hibo bared that the school already applied for membership last year, just as the ongoing season began. "We already sent the application. Mga October or November namin sinubmit. Na-receive na ng PBA," he revealed. Once approved, the Titans will be the first school team to join the PBA, and Hibo is already having mixed feelings about it. "Actually magkahalong fear and excitement," Hibo bared his feelings about the PBA application. Right now, the college's focus is on not just the D-League Aspirants Cup, which will begin on Thursday, but as well as its varsity teams as well. "Ang preparasyon na ginagawa namin ay [ang pagiging] very active sa D-League, collegiate, at pati na sa high school at elementary." Hibo also told his bullishness about his team's chances in the tournament with Teng and Dario bolstering the Taganas and Arambulo-led squad. "Yung mga players na nakuha namin ngayon eh swerte dahil medyo malalakas, mga kilala sila. Saka mga PBA-ready na sila," he continued. In fact, AMA president Amable Aguiluz said that he wants no less than a championship this season during the press conference.